Bedford Blues debutant Biyi Alo hailed his new team-mates following their win over Rotherham Titans, writes Daryl Greenland. 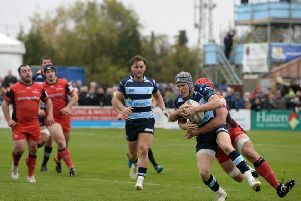 Alo made his debut for the Blues in front of the 2,574 fans in attendance at Goldington Road on Friday evening and he looked like a great new addition for Bedford. Alo said: “It feels pretty amazing that I marked my debut with such a great result over Rotherham and I’m proud of all the boys for the amount of effort they put in to win the game. “We played excellently in the first 60 minutes of the game and it was great to play a part in the victory. “Our defence stayed strong throughout the game even after Rotherham kicked into gear late on. Alo has been registered with Saracens for five years but he’s been training with the Blues for just over a year while spending time on loan at Old Albanians. The tight head prop has been described as a power house in and amongst the scrum and this was witnessed by the home fans on Friday evening as he seemed too much to handle for the Titans forwards. Alo added: “We may have let them back in to the game pretty late on in the match but it proved that it wasn’t enough as we carried on with a solid defence up until the final whistle.